This tutorial assumes a basic knowledge of AToM3 meta-modeling and goes into the nitty gritty details of writing constraints/actions in Python code. NOTE: If your viewing this in MSWord, select View (in the menu) then Web Layout. Otherwise the images are cropped and you won't see what's going on! There's also a Zoom in the View menu, which I set to 75%. No doubt Open Office has an equivalent functionality. 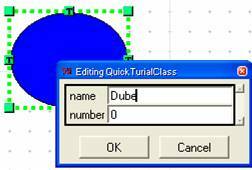 1) Initial setup, I assume you've saved this model, given it a visual representation (to both class and association, including giving each visual icon the attributes of the class/association), named it as QuickTut after pressing the EDIT button, and generated it. It consists of one class and one association. 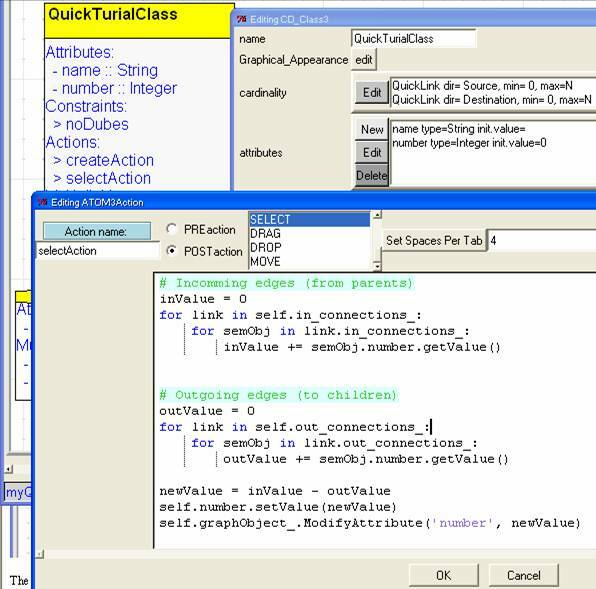 The class has an attribute "name" and "number" of types String and Integer respectively. The association has an attribute "name" of type string. For debugging purposes, giving all classes/associations an attribute name can come in very handy, as you can simply traverse the entire graph and print them out (see next step). 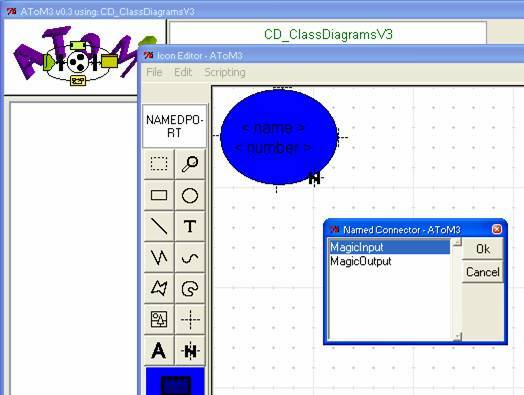 3a) Create a button to trigger the graph traverser. Start a fresh copy of AToM3, file open (Ctrl-O), choose *_META.py as the filetype, and find the generate buttons model for your formalism. 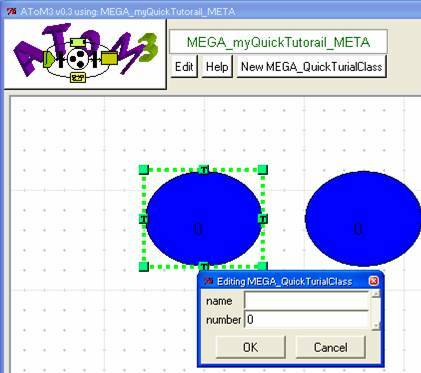 3c) Create a new button. Edit the button. For the "Select Attribute", choose either Text or Image. 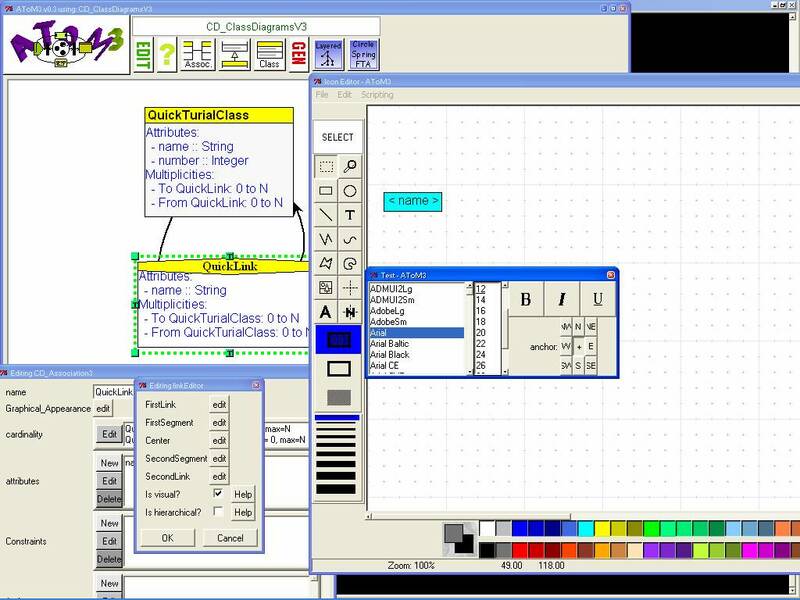 Drawing_Mode (checked) means that pressing the button in the toolbar does nothing UNTIL the user presses Ctrl-MouseRight on the canvas. 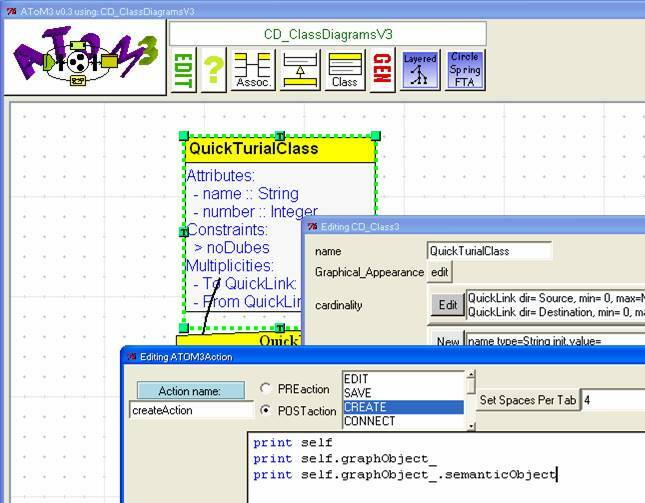 For a graph traverser, UN-CHECK it. 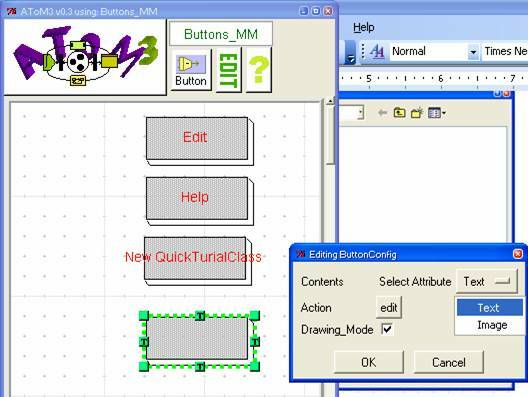 3e) Save the buttons model. To make the changes take effect, you must now restart AToM3. b) The associations were traversed first! In general, when changing node.myAttribute, you must also do node.graphObject_.ModifyAttribute('myAttribute', newValue) to update the visual representation (only applicable if you actually display the attribute in the icon of course). 4b) Re-generate the meta-model. Open it up. Create an instance of a class. Type in the name "Dube" and press enter. 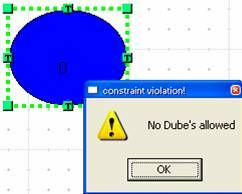 4c) The constraint violation dialog opens up and the name is rejected. 5) Simple example of an action. In an action, there's no point in returning a value. Whenever your action is more than a few lines, it is recommended you use the file import methodology shown in the graph traverser example (step 2). The trigger "CREATE" means that the action will be executed just after this class is instantiated. In this case, "self" is a reference to an instance of QuickTurialClass. In the previous example of a graph traverser, this is a "node". If you want to get really deep, it is an subclass of ASGnode.py and is often called a "semanticObject". Interestingly, self.graphObject_.semanticObject = self (self.graphObject_ is the visual representation, subclass of graphEntity.py or graphLink.py). Whenever we SELECT an entity, we would like the number attribute to equal its parents minus its children (example: clicking on A then A = C – B = 1, or clicking on C then C = B – A = 1, or clicking on B then B = A – C = -2). 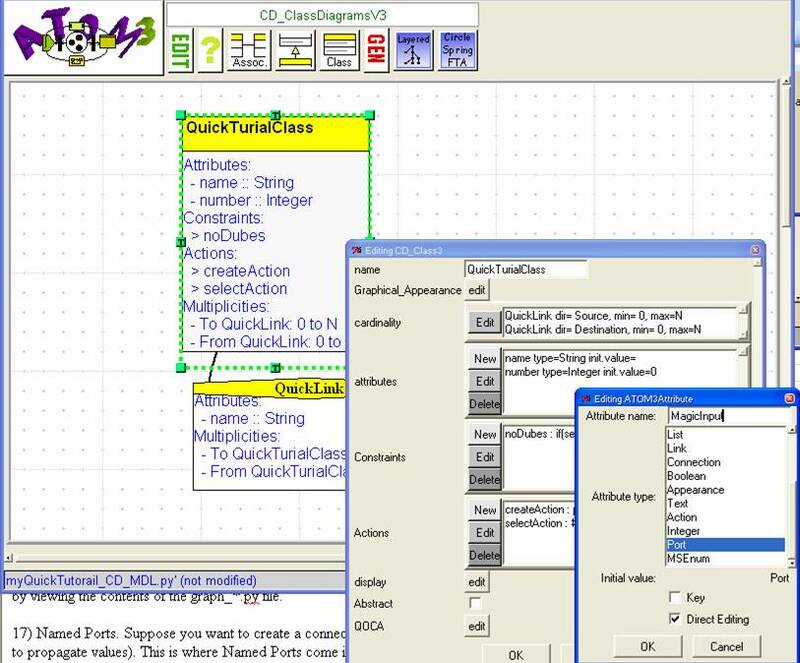 7) Re-generate the meta-model, open the formalism, and click on the instances of class QuickTurialClass. You'll see the numbers automatically change just by selecting the instances. Never assume in an action that a in_connections_ or out_connections_ are non-empty lists. In particular, a "CREATE" trigger often precedes the actual existence of in_connections_ and out_connections_ entries. For these situations, you'll want a "CONNECT" trigger inside an association instead that does the work (i.e. : the POST condition of a "CONNECT" trigger can be counted upon to actually have populated the in_connections_ and out_connections_). Constraints will be added/removed in a logical manner by other mechanisms. 10) You can add constraints to classes too, but generally the only worthwhile constraint is a static size constraint. This is what the template for classes does (when activated). For an example of the usage of these constraints, you should have a look at the PacMan formalism (hopefully included with your AToM3 distribution!). Also, the constraint solver may be disabled, check in OPTIONS (click the big AToM3 logo in the top left) that this is not the case. 15) Sometimes the attributes built-into AToM3 are not enough! String, Integer, and Float are nice, but what if you want a tuple (String, Boolean, Boolean) type? The following picture crams in the entire process! In the class diagram formalism, you suddenly realize your type is missing. 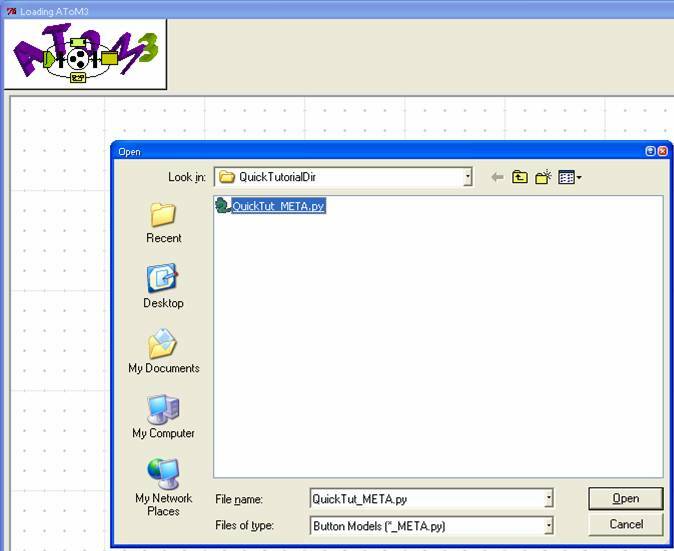 You press Control-M (Model Menu) and choose "Edit Types". A new AToM3 in the type formalism pops up. Create a new "TypeName" (in this example I call it BooleanTuple) and create new "LeafeType" to make up the string, Boolean, Boolean tuple. Draw an arrow from the TypeName to the LeafType. Afterwards, draw arrows starting from the edge to the other LeafType's. When done, save the type model (just in case), then press the "Gen Python" button. Code will appear in "User Arer/User Formalisms/". Two files are created, "BooleanTuple.py" and "BooleanTupleImpl.py" in this example. You must manually cut and paste them into your formalism directory. The Name & className (where the 3 is in the picture below) should be automatically set, but if not, just give it the name of "BooleanTuple" (in this example) for both fields. Press OK (hopefully you did the cut & paste, otherwise this won't work so well). Edit your class, and add the new attribute which is now there in the list. The new attribute is a composite of 3 basic attributes, and you can set initial values for each part. NOTE: Be wary when saving models when you have just added a custom type. Make sure that you keep your AToM3 on that class diagram only, and restart before doing anything else. For example, you might add a new type, close the class diagram, open up the PacMan formalism, and then save a PacMan model… with the result that the PacMan model then depends on the BooleanTuple type. A very unfortunate thing when you then try to open that PacMan model! If this happens to you, it is simple to modify the model file and remove the type info (check at the top and bottom of the file, just comment any lines containing references to the type). 16) It is possible to set actions directly on the visual icon in the IconEditor. I recommend not doing that and instead putting the action directly on the class/association. You just do something like self.graphObject_.gf41.setColor('green') in the class/association action. I recommend this because it's obvious by looking at a class what the actions are, but because the visual icons are attributes of the class, it's not at all obvious what the visual icon actions are. NOTE: gf41 is the name of a particular graphical component of a visual icon. You can find the correct name for your icon either in the IconEditor (it shows the name of what your name is hovering over) or by viewing the contents of the graph_*.py file. 17) Named Ports. Suppose you want to create a connection to a specific location on an class instance (visually) and be able to access that connection easily (such as to propagate values). This is where Named Ports come in handy. To create a named port, you must first create an attribute "Port". Now head over to the Icon Editor (edit the Graphical_Appearence). Click on the bottom right of the toolbar where it shows a N. A dialog appears to allow you to select WHICH named port you want. 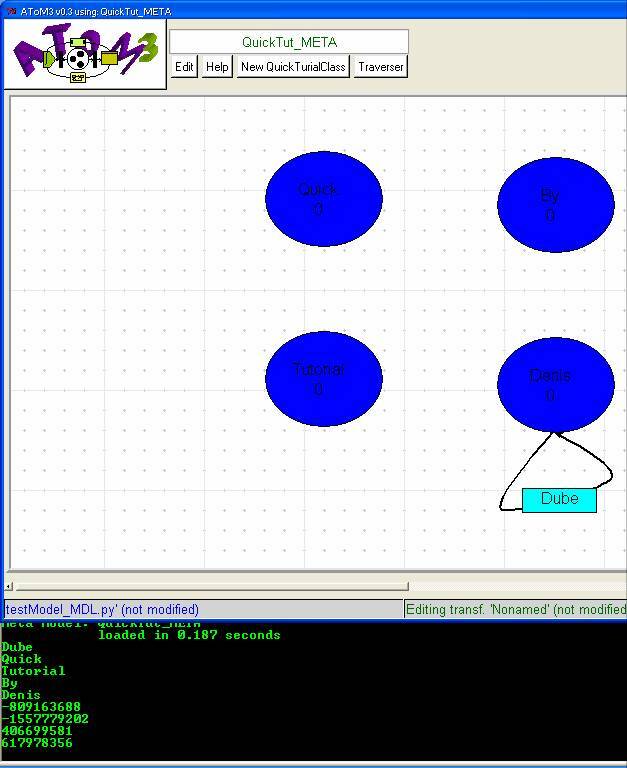 In this example, I create an input in the bottom right, and an output in the top left. Now re-generate the formalism, when you drawn an arrow from a QuickTurial class, you'll see this dialog (if you click anywhere near the "MagicOutput" port. You can still do a regular connection by clever clicking… such as on the outside of the circle in this case). 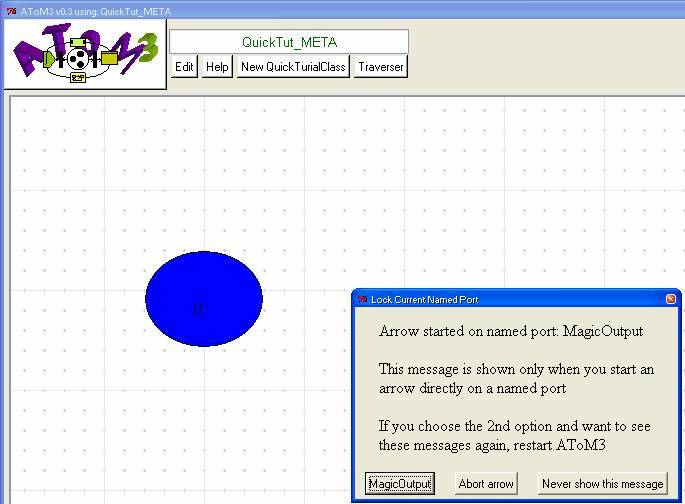 If you select the "MagicOutput" button in the dialog, it will then lock the arrow so that it starts at the named port (and never moves from there). Note: normally you would identify (with a box, or something) exactly where your port is (visually). 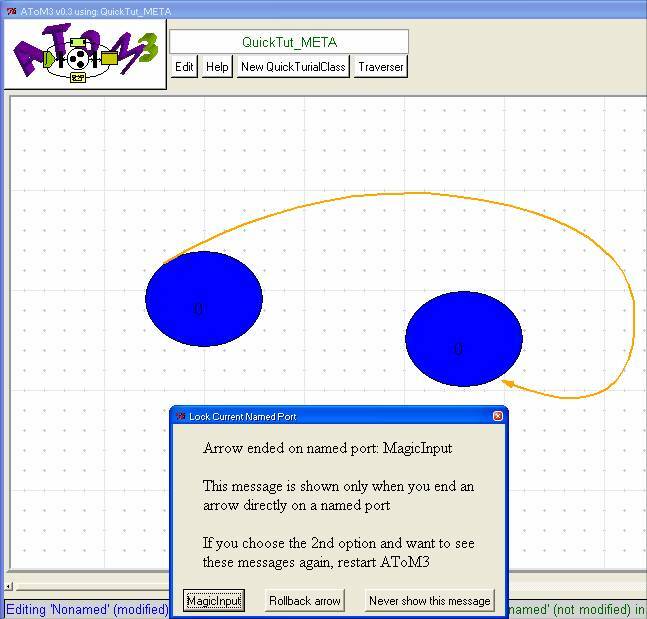 # NOTE: self.out_connections_ != self.MagicOutput if an outgoing arrow starts at a different named port or at a regular port. 18) Cloning a formalism. Suppose you want to make a similar formalism to an existing one but with some important changes. 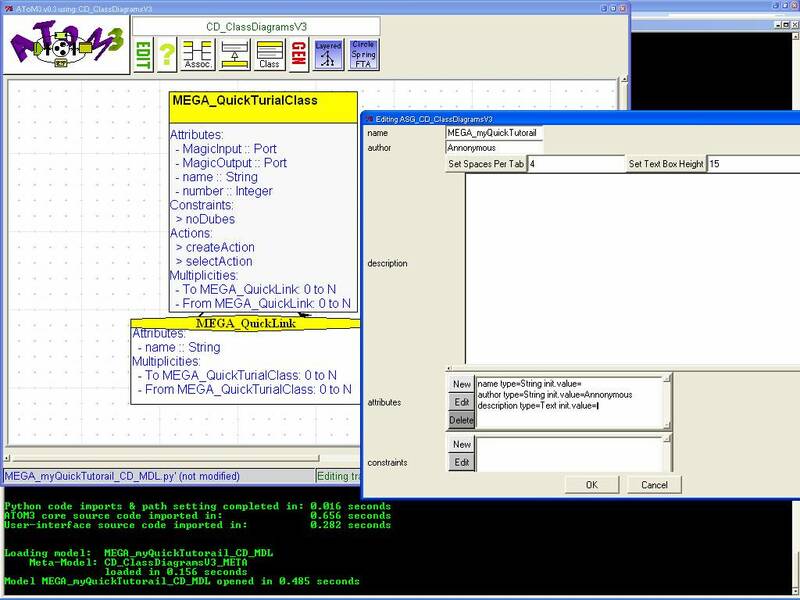 Rather than start working from scratch you'd like to take advantage of the existing meta-model and graphical icons. However, if you simply copy them to a new directory and both formalisms are opened at the same time, you'll have a big problem (two files with the same name but different implementations cannot be handled by AToM3 at this time). In fact, even if two formalisms are NOT simultaneously open, the wrong file *might* be loaded. BEWARE! 18a) If you simply want to recycle graphical icons, then graphRenamer.py (located in the central AToM3 directory) is your friend. Copy this file to a folder containing just the icons you want to re-name, then execute it. For each graph icon, such as graph_atomicNinja.py it will prompt you for a new name, such as "reactiveNinja", and create a new file graph_reactiveNinja.py in the same directory. Give an extra name prefix to your re-named formalism. This is somewhat "intelligent", so if you use the re-name twice, only the last prefix will be kept. 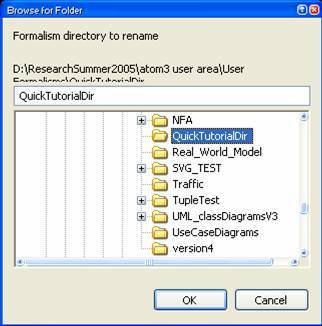 The formalism is re-named… and a dialog is shown to tell you what you must do next! NOTE: You *could* ignore this step and it will probably work… but this is MUCH safer. 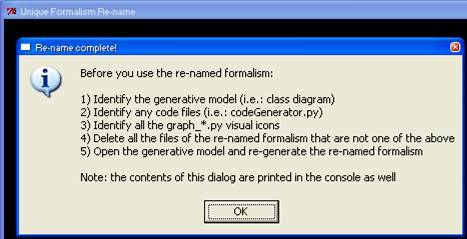 The final step is to open the generative model and re-generate the re-named formalism. First, check to make sure everything is in order… (including pressing the "EDIT" button to make sure that the new name of the formalism is what you wanted!). The re-named formalism in action. NOTE: the "traverser" button got lost when the buttons model were re-generated. You must either re-make the button or you could save the *_META.py file (i.e. : not delete it in the step where I recommend deleting all those files. However this is not *safe* because when you re-generate the formalism names may differ. Good luck though! ).